Gallery 803 was started by the creative response group at Downtown Church of Christ as a community outreach program. The gallery is filled with art from members of the community, members of the Downtown church and Harding students. 803 North Oak Street was originally acquired by the Downtown Church of Christ as a place for their creative response group to meet on Sundays to discuss scripture, and come back the next week with a creative response to that passage. Gallery 803 director Jennifer King said people have come back with paintings, poems, music and many other forms of art. Several galleries in Searcy open their doors from 5 p.m. to 7 p.m. for the First Friday Art Night held on the first Friday of each month, where members of the community can visit a variety of studios throughout town to see what local artists and other creatives are up to. Gallery 803 opens their doors for these monthly events. Gallery director Jennifer King said that while it is a professional gallery, the setting lends itself to be more relaxed and cultivate conversations rather than silently looking at art. King said the gallery tries to highlight this by bringing in a local DJ to play music and having a room completely set aside just for conversation. “The aspect of creating a creative community is like the first level of what we’re doing, we just want to have a community available to people,” King said. King invites artists all over Searcy to display and sell their work in Gallery 803. Being an art student at Harding herself just last year, King knows the importance of having gallery experience. King said students get to start learning how to price and tag their artwork, and the gallery is a great place for them to start learning. “The whole process of setting it up and seeing what pieces can go together, and getting to see people interact with my art face-to-face is an amazing experience,” senior painting major Hannah Skelton said. 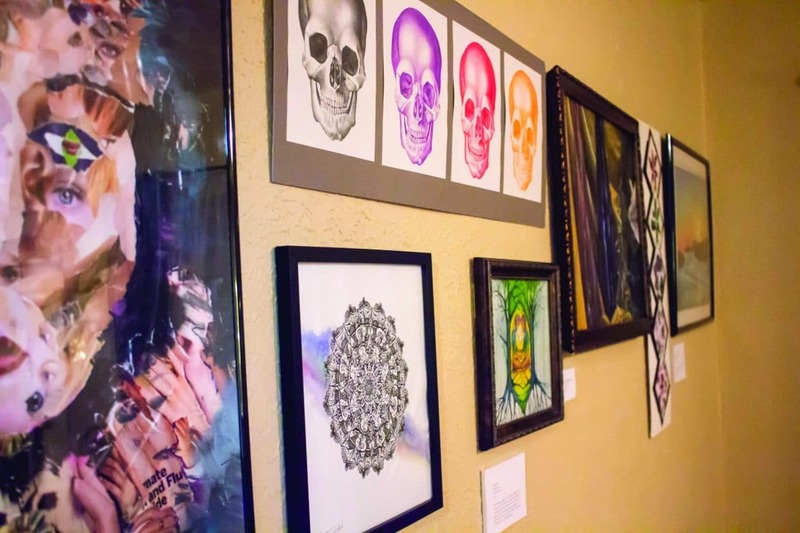 Skelton along with senior general studies major Audrey Hodges and two other Harding students, senior Raeanne Kiihnl and senior Meliny Pond all displayed their work at the Gallery 803 event on Nov. 2. Skelton said the only experience she has had with a gallery was for her sophomore portfolio review, which is required in the art department. “For students that aren’t art majors, we don’t have a lot of opportunities to be involved in a gallery, so it’s a new experience, and it’s really cool that we get to be involved,” Hodges said.